Mother’s Day is almost here, which means you will soon have the chance to show your mother just how special she is. While there are plenty of options for what to get mom for her special day, jewelry has always been a timeless choice. Our jewelry store carries a number of unique, high-quality pieces that are sure to make an impression, but which one to choose? Here are three options for great gifts to give the special lady in your life this year. Infinite Love Mother and Child Pendant: Perfect for the new mother in your life, this limited edition pendant was specially created to commemorate Mother’s Day. This pendant features a heartwarming scene of a mother lovingly holding her child. It’s made of glittering diamonds set in sterling silver and 24 K gold vermeil. Belle Etoile Constellations Collection: For the lady with sophisticated taste and a flair for the colorful, consider the Constellations collection by Belle Etoile. Constellations features pieces made of sterling silver plated with colorful enamel. Whether she’d love stacks of lovely bangles, some bright, spring-inspired earrings, or a touch of color from a beautiful statement ring, the Belle Etoile collection is perfect for adding some classy hues to any jewelry collection. Charles Garnier Perfect Heart Pendant: This elegant pendant is great for any occasion, yet its elegant style is no doubt in a class of its own. 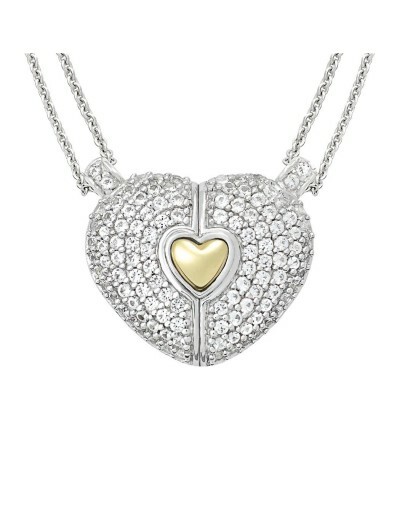 This necklace features a polished sterling silver heart pendant on sterling silver chain. The pendant is intricately outlined with a row of white sapphire stones. Our jewelry store carries a number of fashionable, sophisticated pieces that nay mother would love to have. Come and visit us at Doumato jewelers when you’re ready to buy the mother in your life a gift that she’ll always remember.